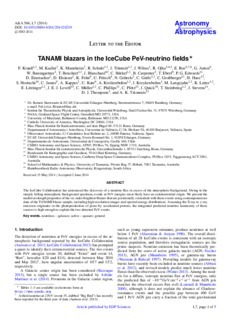 The IceCube Collaboration has announced the discovery of a neutrino flux in excess of the atmospheric background. Owing to the steeply falling atmospheric background spectrum, events at PeV energies most likely have an extraterrestrial origin. We present the multiwavelength properties of the six radio-brightest blazars that are positionally coincident with these events using contemporaneous data of the TANAMI blazar sample, including high-resolution images and spectral energy distributions. Assuming the X-ray to γ-ray emission originates in the photoproduction of pions by accelerated protons, the integrated predicted neutrino luminosity of these sources is high enough to explain the two detected PeV events.